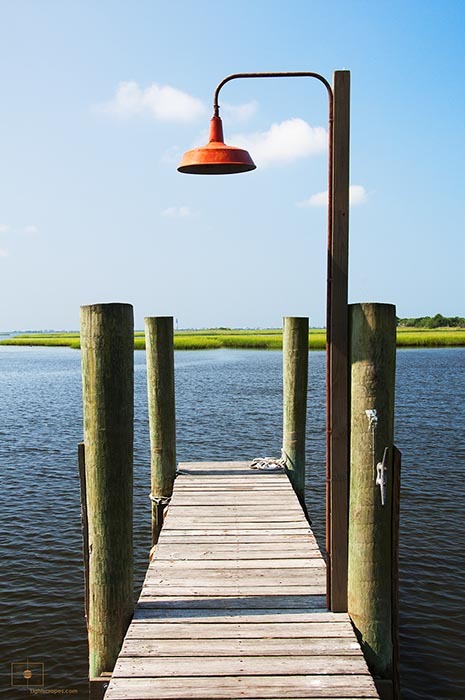 Landscape photograph of a dock with a red lamp from the mouth of the Cape Fear River. Looking out towards the of green marsh, tranquility and quietude pervade the idyllic scene. The image is divided into harmonic rectangular sections by the pilings, dock, lamp, and horizon with the lamppost and clouds providing relief from the regularity of the compositional structure.